When it comes to dumpster rental in the Quad Cities area, both the Quad Cities Ia and Quad Cities Il, Landrum Disposal now has 15 solid years of experience. 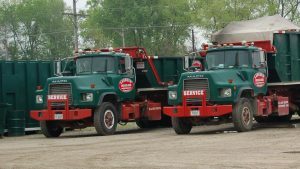 Most of the waste management companies in the Moline, Rock Island, Bettendorf, Davenport area are large nation-wide giants who don’t cater to homeowners and small business. Therefore, when it comes to great dumpster rental service at reasonable costs, go local. Contractors requiring roll off dumpsters for construction projects in Moline, Illinois already know that our response time to empty and return rental dumpsters is far better than our competitors in the waste management business. And our residential or homeowners in Bettendorf, Iowa rent dumpsters from us because our customer service representatives are friendly and helpful to customers who may not have ordered dumpsters or don’t understand dumpster sizes or dumpster pricing. Junk removal service for Quad Cities area homes and business is provided by various companies and individuals. We provide junk removal services for small quantities of wast or just a few items (563) 332-2555. Full service junk removal service can be costly. When your waste exceeds 10 cubic yards or if you want to take your time to load your unwanted debris, you might be better off renting a dumpster. Unlike junk removal services, dumpster prices can be quoted over the phone before we arrive at your home or business. What size garbage collection roll off do you want? When do you want your small dumpster delivered? Where do you want your dumpster to be placed once it arrives? And that’s about all we’ll need to know to provide a dumpster rental quote and to get you hooked up with a roll off. What Size dumpsters Are Available For Rental In The Quad Cities Area? We rent 6,10, 20, 30 cubic yard roll off containers to all Davenport, Iowa area locations. When deciding what size roll off is right for you, you’ll need to do a quick calculation about how much waste you want to dispose of and then order a dumpster large enough to hold at least that much material. When in doubt, always get the larger size to ensure you don’t have to have a smaller bin emptied numerous times. Copyright © 2019 Landrum Disposal, LLC. All rights reserved.